16-page illustrated Finger Lakes Fan how-to's. Suitable for porch chairs, dining room chairs. Use wide binder cane or 3/16 to 1/4 flat oval. It takes one 500' hank of binder cane or one lb of reed to weave the average seat. This pattern is woven "over 4, under 4". 16-page Finger Lakes Fan Booklet, fully-illustrated how-to's. 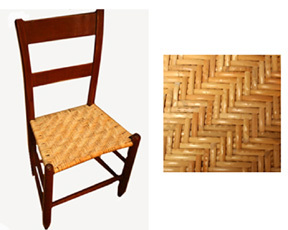 Suitable for weaving porch chair seats, dining room chairs.